For more than one century Sherlock Holmes has not gotten old. Tall, thin, with an eagle’s nose, he first appeared in the streets of London in 1887 and has lived in human imagination since then, constantly protecting innocents, defeating criminals and preventing violence. It is largely thanks to Holmes that the traditional London of the end of 19 century remains alive today. With his magnifying glass and his collection of smoking pipes, this detective is a living myth and possesses unlimited vitality. His ability to make logic deductions attracts the attention of millions of people. Each year the books with his adventures get new editions. From time to time films are produced. TV series are not difficult to find. Even in our century many admirers send air mail letters to him, using his traditional address of Baker Street, 221-B. His worldwide popularity is incomparable. He became one of the greatest characters in the literature of all time. Even his creator, Arthur Conan Doyle, was unable to defeat Sherlock Holmes. At some point Doyle felt that detective stories had no real importance in his literary work. He wanted to write books of more significance. In an attempt to get rid of Holmes, Doyle described his death in a story, but the public rejected the idea. The pressure from readers and editors was so great that Doyle had to reveal in “The Empty House” that in fact Sherlock had not died - and new adventures started being published again. There is something, however, that many have not realized: behind his enigmatic appearance, Holmes has a spiritual view of the world. While defending Life and justice, he uses esoteric knowledge. Arthur Conan Doyle had a personal interest in mysticism since youth and dedicated the last part of his life to the propagation of Spiritualism “after 36 years of esoteric studies”, as he writes in the preface to his memoirs. The 60 original stories of Sherlock Holmes clearly show the human dramas of jealousy, greed, falsehood and violence. At each adventure the detective unveils and destroys a chain of illusions, and sometimes of self-illusion. Yet the universe of Holmes’ action did not stop growing. After Conan Doyle, other writers have adopted the immortal character of Baker Street and added all kinds of new stories, some of which considerably distort his life. Sherlock is a private detective whose areas of personal interest are extremely varied and often paradoxical. He is an effective boxer, yet few can play violin like him. He practices baritsu (bartitsu), a British-Japanese martial art, but also spends sleepless nights making complicated chemical tests in the small apartment where he lives and works. His colleague John H. Watson described the working environment. “There were the chemical corner and the acid-stained, deal-topped table. There upon a shelf was the row of formidable scrap-books and books of reference which many of our fellow-citizens would have been so glad to burn. The diagrams, the violin-case, and the pipe-rack - even the Persian slipper which contained the tobacco.”  There is a great amount of newspapers and books. The fireplace is there. Living in the same building, Mrs. Hudson does the cooking and the housecleaning and opens the door to Holmes’ apartment. The detective reads ancient and religious texts. In the opening scenes of the story “The Golden Pince-Nez”, he spends a whole day examining the original text of a XV century palimpsest with a magnifying glass. 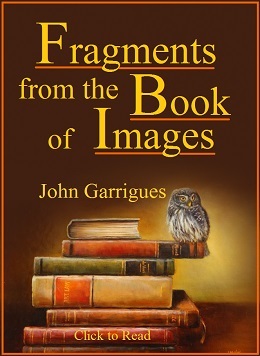 The palimpsests are parchments whose texts the scribes used to erase, so that other documents would be written; but it is not impossible to see the previous texts which in some cases were scraped or washed off long before. Having an extraordinary mental power, Holmes loses no time or energy with trifles. His external behaviour is unpredictable. He has no attachment to the world of appearances. The London detective is a master in the art of disguising himself and can easily adopt the external characteristics of the average middle-class citizen, or of an old querulous beggar, if this helps him make easier progress in his investigations. In the first paragraphs of “The Adventure of Black Peter”, Watson reveals that Holmes has numerous disguises and names “with which he conceals his own formidable identity”. The detective has at least five small refuges in different parts of London in which he is able to change his “personality”, using them until some specific task is accomplished. Holmes faces danger at every moment. His ability to take people by surprise is important for him to survive; yet this alone would not be enough. He has developed also concentration, courage, detachment, intuition, altruism. These are all qualities of an advanced student of the esoteric tradition. Holmes seems to have borrowed them from the philosophical and psychological world of Conan Doyle. 1) One-pointedness. His remarkable degree of mental concentration suggests a personal atmosphere similar to that of Raja Yoga and can only be the result of a long process of self-training. 2) Direct perception. The use of telepathy and intuition is eminent in Sherlock’s method of work. In one of its opening paragraphs, the story “The Copper Beeches” records the fact that in the dialogues between the detective and Watson, Holmes uses to answer to Watson’s thoughts, rather than his words. 6) Selflessness. Sherlock is altruistic. Ethics is a central factor for him. He acts to defend the desperate and to protect those whose life is in danger, generally defeating even the worst rascals. His attitude is that of a gentleman. Whenever this is feasible, he aims at reeducating the criminals so as to put them once again on the road of honesty, as we can see in many narratives, including “The Three Gables” and “The Sussex Vampire”. 7) Nameless victories. Sherlock does not look for fame or social position. He prefers to work anonymously and allows the detectives of conventional police to officially present themselves as the ones who won his victories. As a result of this, Mr. Lestrade of the Scotland Yard feels for Holmes a strange combination of envy and gratitude. 8) The elixir. From Alessandro Cagliostro to Helena Blavatsky and Taoist Alchemy, the idea of an Elixir of Life constitutes a key issue in theosophical studies and esoteric philosophy. However, the Elixir of Immortality must not be sought mainly on the physical plane or for a selfish purpose. 9) Preventing a suicide. Sherlock seems to share with theosophists a knowledge of the fact that suicide must be avoided, for it radically expands the pain of the soul in almost every instance, making the suffering last for a much longer time than it would, if such a crime did not occur. Esoteric philosophy teaches that suicide can seldom liberate anyone from difficulties. No individual will effectively “kill” himself: desperate people can only destroy their physical bodies, and in such cases they usually face extremely unfortunate afterlife situations. “What use is it to anyone?”, she asks. 10) Harmlessness. Sherlock follows as much as possible the principle of non-violence. He seldom feels the need to physically attack an opponent and uses no weapon in many of the dangerous situations he faces. When Holmes must have someone arrested, he gets in contact with the Police beforehand and prepares an effective ambush so that the criminal is caught by surprise and sees that an attempt to resist would be useless. After that, using his mental powers, Holmes typically leads the lawbreaker to a final talk that is both frank and balanced. The whole story is clarified to all parties, and ill feelings are avoided or uprooted as much as possible. “Seven-thirty, the day after tomorrow”. Good music is an effective way of bringing peace to the soul. For Holmes, playing violin is a way of meditation. When a challenge faced by him becomes most difficult, he isolates himself from the world and spends long hours solely dedicated to music, in the “violin-land, where all is sweetness, and delicacy, and harmony”. In such occasions, his violin sounds until the wee hours. The investigative technique that uses elevated states of consciousness produces good results: in the following morning he possesses the key idea that will help him solve the problem. Upon arriving at Baker Street, Watson finds Holmes “huddled up in his armchair with updrawn knees, his pipe in his mouth and his brow furrowed with thought”. Before starting to write stories about the London detective, Conan Doyle spent some time studying the original teachings of theosophy. He carefully read the books by Alfred Sinnett which transcribed a number of Letters from the Mahatmas. 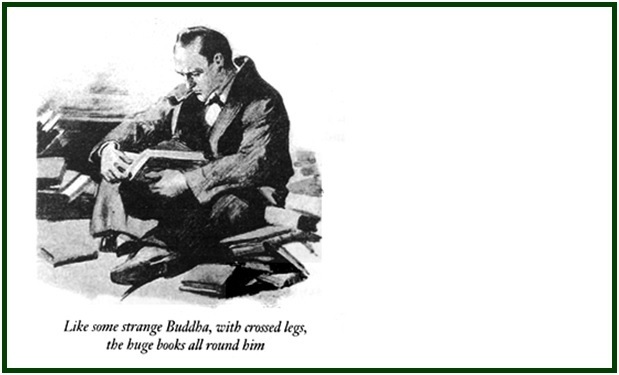 Sherlock Holmes was strongly influenced by such readings. Let us see a few examples. Indeed, the student of esoteric philosophy needs various incarnations to fully understand the relation between microcosm and macrocosm, mortal life and immortal life. Good sense complements abstract meditation. In an investigation, as in life in general, two decisive factors are carefulness and efficiency in the use of information. The investigator must speak little and know much. The practice of silence - a central tool in Sherlockian method - is equally important in the spiritual path and for the mental concentration of students of philosophy. 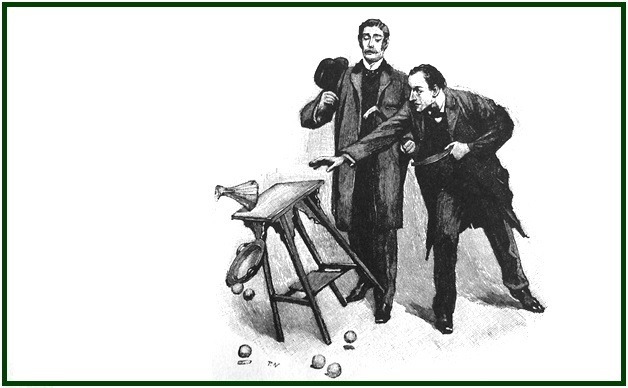 Although Holmes fully trusts Watson, he rarely shares his reasoning with his colleague before reaching the final answer to the problem to be solved. Esoteric philosophy says there is a reason for keeping silent: intuitive thought consists of such a subtle sort of mental vibration that it is easily contaminated and broken when mixed with denser matter belonging to conventional thought - even when emitted by good-willing individuals. Therefore the “voice of the silence” must be heard in the temple of one’s heart. For this reason there are certain projects and ideas of which we only dare to speak once they have a certain amount of density and strength. Persons who are in harmony with us may be able at times to perceive our feelings with no need of words. In spite of his positive qualities, Holmes has significant shortcomings. The high levels of tension he experiences in work has negative effects on his way of living, and Watson often refers to his mistakes and moments of failure. A great hero needs a great scenario: the city where Sherlock Holmes lives and works is as immortal as himself. Time does not change the old mysterious London, immersed in fog, its streets being traveled by beautiful carriages. Watchful readers may be able to hear the sound of horses’ hooves. At night, lanterns dimly illuminate the city which Watson’s descriptions make it easy for every reader to see. Holmes himself perhaps will be met by one’s imagination in some dark alley, making a secret investigation. He will be disguised as the seller of rare old books, or he will be impersonating a beggar, so as to defeat some dangerous gang of thieves which will be arrested with no chance of resisting the police. Being a popular detective of a city that never dies, one should not expect Sherlock Holmes to be also a daily reader of books by Plato, Plotinus and Blavatsky, or an associate of the Independent Lodge of Theosophists. Arthur Conan Doyle is not one of the greatest thinkers of all time in human history. However, Sherlock Holmes can be easily recognized as an honest and selfless individual who defends ethics and the common good. He developed to a considerable degree the altruistic powers of abstraction, of mental concentration and self-sacrifice for the ideal of justice. His practical view of life has essential aspects in common with the original teachings of esoteric philosophy. “The Adventure of the Empty House”, in “The Original Illustrated Sherlock Holmes”, Arthur Conan Doyle, Castle Books, undated edition, New Jersey, USA, 636 pp., page 460. See also the volume “The Complete Stories of Sherlock Holmes”, Sir Arthur Conan Doyle, Wordsworth Library Collection, Wordsworth Editions, UK, 2007, 1408 pp., page 862. “The Complete Stories of Sherlock Holmes”, Sir Arthur Conan Doyle, Wordsworth Editions, UK, 2007, 1408 pp., pages 1009-1010. “The Complete Stories of Sherlock Holmes”, p. 431. “The Complete Stories of Sherlock Holmes”, p. 476. “The Complete Stories of Sherlock Holmes”, p. 855, and “The Original Illustrated Sherlock Holmes”, p. 454. “The Complete Stories of Sherlock Holmes”, p. 946. See the opening lines of “Black Peter”. “The Complete Stories of Sherlock Holmes”, Sir Arthur Conan Doyle, Wordsworth Library Collection, p. 1359. “The Complete Stories of Sherlock Holmes”, p. 1341, not long before the end of the story. “The Read-Headed League”. See for instance “The Original Illustrated Sherlock Holmes”, p. 35, left side column, or “The Complete Stories of Sherlock Holmes”, p. 461. “The Complete Stories of Sherlock Holmes”, pp. 1344-1345. “The Occult World”, Alfred P. Sinnett, facsimile edition of the 1884 edition, Kessinger Publishing Company, Montana, USA, 160 pp., see pp. 89-90. “A Study in Scarlet”, part I, “The Science of Deduction”, “The Complete Stories of Sherlock Holmes”, p. 20. “The Occult World”, Alfred P. Sinnett, 1884, facsimile edition, Kessinger Publishing Co., see p. 90. “The Mahatma Letters”, 1926 edition, published by T. Fisher Unwin Ltd., in London, UK, with 493 pages and Index. 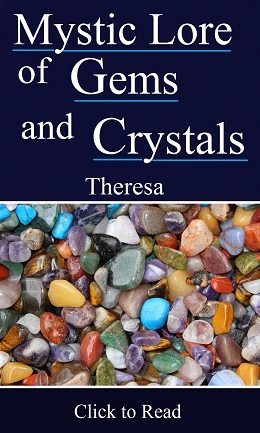 The book is available in our websites. See letter XV, pp. 92-93. “A Study in Scarlet”, part I, “The Science of Deduction”, “The Complete Stories of Sherlock Holmes”, p. 22. 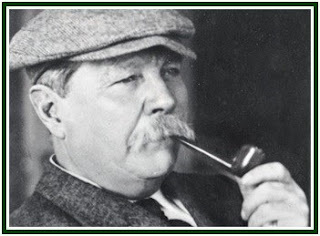 Read in our websites the article “Conan Doyle Studied Theosophy”. The above article was published on 10 June 2018. It is a translation from the Portuguese language text “A Filosofia de Sherlock Holmes”.